Right-wing presidential candidate who vowed to move embassy to Jerusalem, close Palestinian embassy in Brasilia, holds double-digit lead. 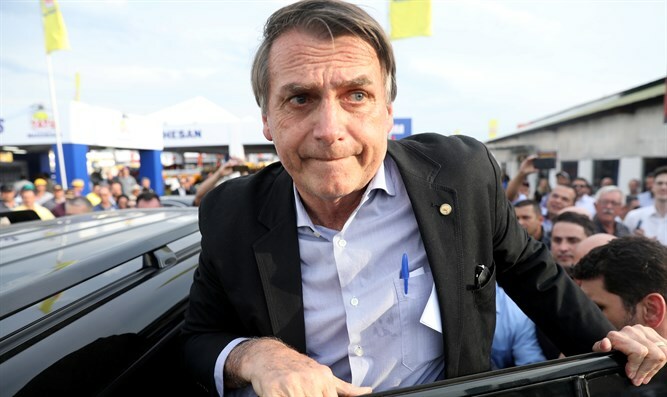 Brazil is poised to elect a right-wing former army officer and self-described admirer of President Donald Trump in a run-off vote for the presidency later this month, polls show after the first round of voting. On Sunday, Brazilians headed to the polls for the country’s general election, resulting in big gains for right-wing and anti-establishment factions, including Rio de Janeiro federal deputy Jair Bolsonaro’s Social Liberal Party. A staunchly social conservative, free market-oriented, the SLP gained 44 seats in the Brazilian congress’ lower chamber, rising from 8 seats to 52, while the left-wing Workers’ Party dropped from 69 seats to 56. Frustrated by a series of corruption scandals involving the country’s largest parties and an epidemic of violent crime, voters backed Bolsonaro’s SLP in the presidential vote, with Bolsonaro winning 46% of the vote, compared to 29% for the Workers’ Party candidate and former Sao Paulo mayor Fernando Haddad, who is the son of Lebanese immigrants. The results marked a dramatic shift from Brazil’s last general election in 2014, when the Workers’ Party, led by Dilma Rousseff, defeated the centrist Brazilian Social Democracy Party. The SLP did not field a presidential candidate in the election. A wave of corruption scandals, however, culminating in the impeachment of Rousseff have opened the door for less traditional, anti-establishment candidates. Bolsonaro, who has often been compared to President Donald Trump, cemented the comparison Thursday when he expressed his admiration for the American president. “I am an admirer of Trump,” Bolsonaro said. While the Workers’ Party has compared him to Adolf Hitler, Bolsonaro has rejected claims he is aligned with the far-right, and has touted his support for the State of Israel. Prior to the October 7th vote, Bolsonaro vowed to relocate the Brazilian embassy in Israel from Tel Aviv to Jerusalem, joining Guatemala and the United States in recognizing Jerusalem as the Israeli capital city. Polls suggest Bolsonaro’s double-digit lead in the first round of voting will carry over into the run-off vote, scheduled for October 28th. Bolsonaro beat Haddad by 17 points in the first round of voting, and according to a Datafolha poll released Wednesday night, 58% of Brazilian voters who said they were decided say they plan to vote for Bolsonaro in the run-off, giving the SLP candidate a 16-point margin of victory. Among all Brazilians, including undecideds, Bolsonaro led Haddad by 13 points, 49 to 36. A second poll released Wednesday by the Idea Big Data polling agency showed Bolsonaro with a narrower lead of 54% to 46%. A survey conducted by XP/Ipespe, however, gave Bolsonaro an 18-point lead over Haddad, 59 to 41. Last month, Bolsonaro was attacked during a campaign event in Juiz de Fora, and was stabbed in the torso by Adelio Bispo de Oliveria, a member of the left-wing Socialism and Liberty Party. While Bolsonaro’s wounds were initially described as light, his family later stated that he had suffered injuries to his liver, a lung, and his intestines, and would thus be unable to continue actively campaigning prior to the October 7th vote.